This is a mixture of unadulterated, rich sandalwood oil and powder, blended with natural resins, herbs, spices and pure essential oils. It is formulated according to ancient wisdom, and with the intention to open and stimulate the lowest energetic center, the Muladhara Chakra. 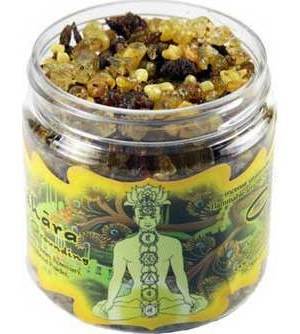 Continued use of our Muladhara Resin Incense will help to balance the chakra and the way it functions, promoting stability, confidence and the sense of being grounded. It also facilitates healthy blood, bones and tissues. The Muladhara Chakra, or the base energetic center, is situated at the base of the spine. This center connects us with the element of earth. Prabhuji explains that the chakra is directly linked to the sense of security, survival, confidence, steadiness, and one's relationship with money, home, work, and the ability to be nourished. Balanced functioning of this chakra leaves us mature, confident, fearless, consistent, peaceful and firm-minded. Made in U.S.A.